This is a completely customized baseball, football and ice hockey theme cake topper ordered by one of our customers. 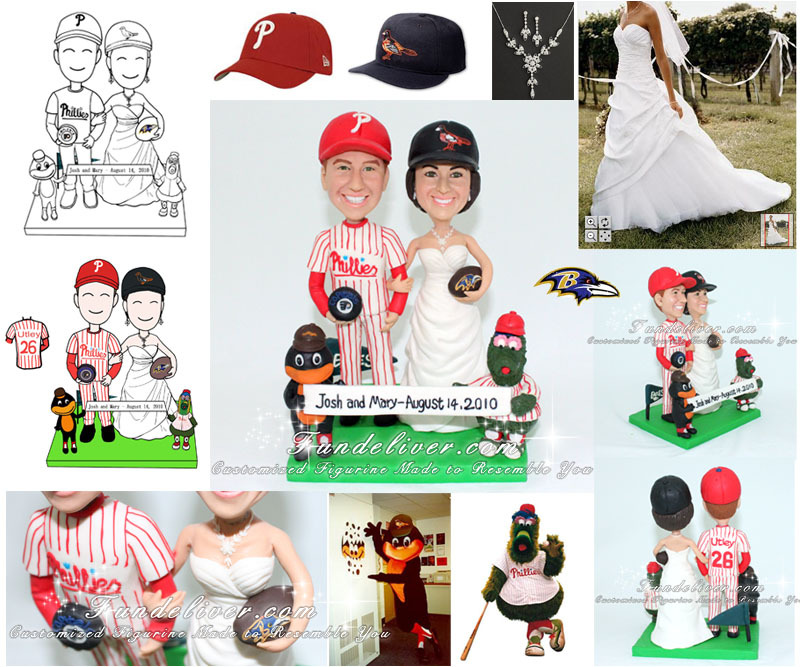 We really don’t know how to name it, since there are 6 teams involved in this sport theme wedding cake topper - Baltimore Orioles, Baltimore Ravens, Washington Capitals, Philadelphia Phillies, Philadelphia Eagles and Philadelphia Flyers. The couple is really a crazy sport fan. The main style is based on our another Philadelphia Eagles Wedding Cake Topper, and added more personalized elements. The bride would like her to wear a gown of her own (as showed at top right of above image), a necklace and dangling earrings. Also add a black Baltimore Orioles baseball cap on her head. For the groom, she would like him to be in the same Phillies uniform and same red Phillies baseball cap as Philadelphia Phillies Cake Topper. However, she would like to alter HALLADAY 34 to Utley 26 jersey on the back. For the base, they would like a green grass base. The bride holding a football with a Baltimore Ravens logo on it. The groom holding a puck. On it, they would like to put both Philadelphia Flyers and Washington Capitals' logo. The pennant in the back is the Philadelphia Eagles. 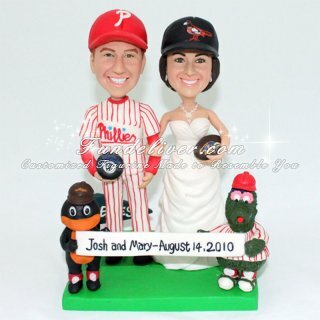 They would also like miniature versions of the Phillie Phanatic and Baltimore Oriole to be in the front, holding a banner saying “Josh and Mary - August 14, 2010”. The Phillie Phanatic is on the bride's side, and the Baltimore Oriole is on the groom's side. This is the funniest and most difficult part, since the banner is made of clay and too heavy for the two mascots to hold it. So we changed the design. Instead holding, we attached the banner in front of the chest of Phanatic and Oriole. The final cake topper looks amazing, love it?